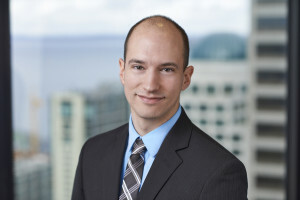 Mr. Siebert joined the Seattle office of Holmes Weddle & Barcott in 2016 to assist primarily with the business transaction work. Prior to joining Holmes Weddle & Barcott, Mr. Siebert worked in-house at a technology company, supporting the sales team on customer deals and assisting the employees on everything from drafting reseller agreements to negotiating vendor terms. While in law school at the University of Washington, as a member of the Washington Journal of Law, Technology & Arts, Mr. Siebert wrote on topics including the FTC’s authority under section 5 of the FTC Act, e-discovery, and native advertising. Before law school, Mr. Siebert received his B.S. from the University of Washington in Psychology, where he spent significant time studying social psychology, particularly the effects of positive stereotypes on specific populations. He also spent a year with AmeriCorps NCCC, traveling around the southwestern United States performing public service work with project sponsors including the Boys & Girls Clubs of America, Habitat for Humanity, and the city government of Yuma, Arizona. Mr. Siebert is a member of the Washington State Bar Association.